This book is fully updated for the release of Chief Architect X9. This book is fully updated for the release of Chief Architect X9 Premium. The step by step tutorials are fun and easy to grasp as they guide you through the design process, from setting up your drawing, drawing walls, doors, windows, foundation, roof, to creating finished construction documents. By the time you have finished the book tutorials you will have drawn a beautiful modern 2-story residence, complete with a walk-out basement, decks, and landscaping. You will also become proficient with Chief Architect X9’s new and enhanced features including the ability to create plant shelves, shorter closets, wall niches, auto L-shaped and U-shaped stairs. The book is loaded with concise explanations with step by step tutorials that will give you a hands on experience in developing a real home design project from start to finish. Other new features that are covered by this book include the control of UI button size, the ability to fully control the display of items in relation to each other, a library painter function, improved render features, the ability to snap dimensions to countertops, polyline solids, and slabs, and many other new enhancements and tools that will make your home design work more proficient and professional. 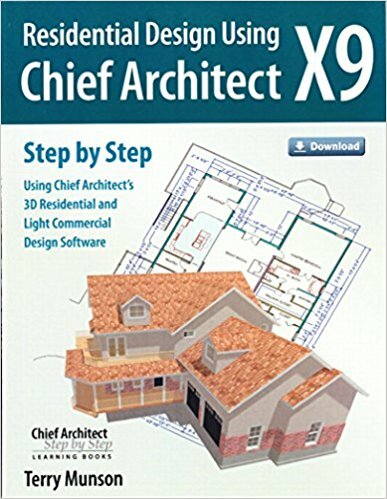 Download Chief Architect X9 working files and bonus chapters.